Through proper sleep we not only facilitate the muscle building process through the protein synthesis, growth hormone and testosterone release that occurs during these hours, but we re-energize and top-up both mentally and physically. Consistently achieving 7-9 hours of quality sleep each night could be the single most important way to ensure we are functioning on all cylinders – and ready to push some serious weight in the gym. When you train heavy your adrenal glands release cortisol. Cortisol breaks down muscle tissue and counters testosterone, human growth hormone and other muscle building hormones. Without proper sleep you can’t replenish these vital muscle building hormones. A lack of a good night’s sleep can also cause other problems such as the body’s ability to store Glycogen, which is used as energy for your muscles. Meaning the effectiveness of your next workout can be diminished. 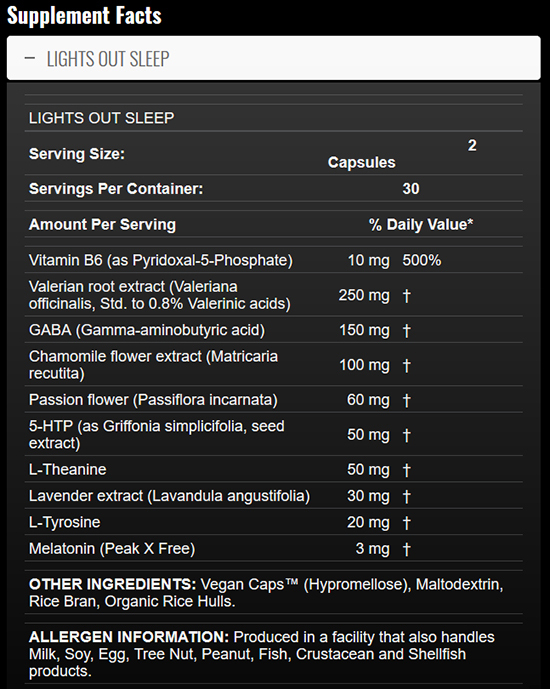 ALLMAX LIGHTS OUT SLEEP Capsules are made with only the best ingredients that are rigorously tested to strict standards that meet or exceed 3rd-Party independent testing and cGMP guidelines. What is LIGHTS OUT SLEEP? 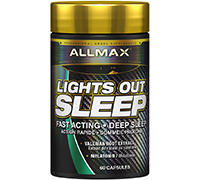 ALLMAX LIGHTS OUT SLEEP is a fast acting sleep aid that is made of the best-of-the-best key ingredients known to produce a deep sleep and to get there quickly. How do I take LIGHTS OUT SLEEP?